5 Must Do Day Hikes and Eats Near Seattle - Come adventure with me. 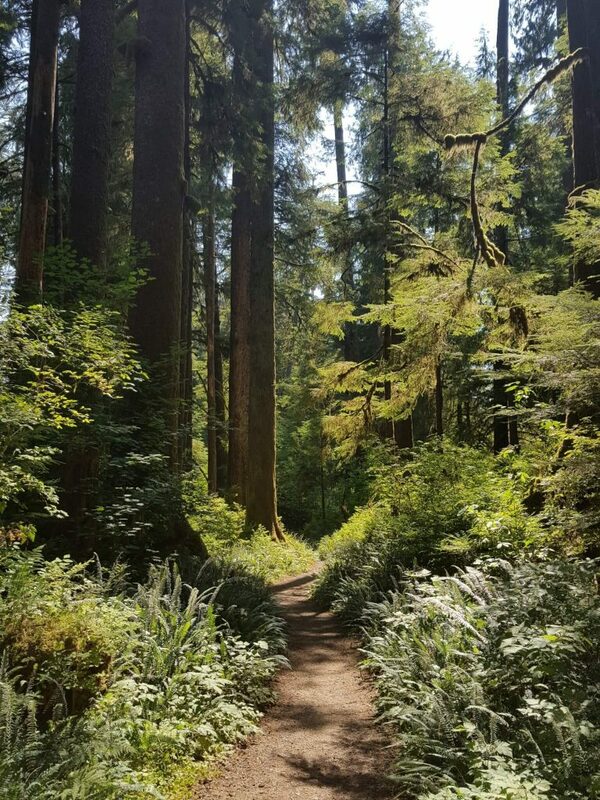 Seattle and the entire Northwest are loaded with great hikes and great eats. On my recent trip to this outdoor playground, I picked the top five day hikes, walks, and urban ambles to adventure near Seattle. I topped off each outing with a salmon or vegetarian treat you must try as well. Our stay in Seattle was short–there’s just so much to do elsewhere in the Northwest! But, we did stop in on a free walking tour through Seattle Free Walking Tours. The Seattle 101 tour was sold out, so we jumped on the Historic Tour. Chris gave us a good tour; Seattle’s history is very similar to typical western frontier history. Adventure. Gold. Gamble. Ladies. Liquor. Fire. Morals. Rebuild. 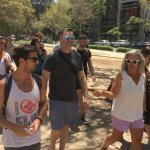 The two-hour walk with Seattle Free Walking Tours ambled about 2 miles and hit the high notes of Puget Sound, the waterfront, the big fire, saloon row, and Pioneer Square. We tipped Chris $20 and noticed the incredibly long line at the underground Seattle tour while on the trek. Chris set up Seattle just enough for us to get a taste and be able to say we saw Seattle. 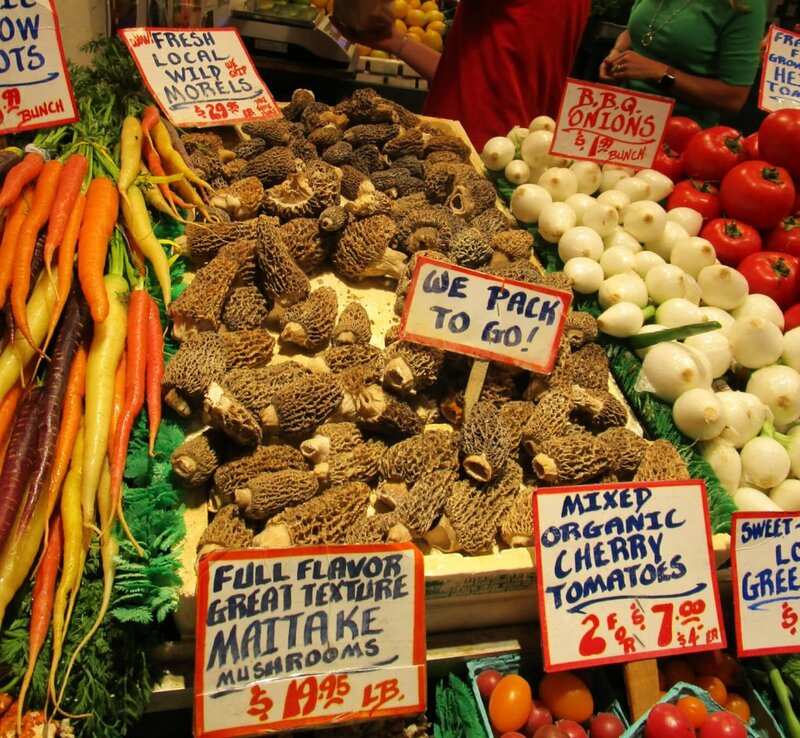 From the free walking tour, we headed over to Pike Place Market. Bypass the other ridiculously long line at the original Starbuck’s and head over to Piroshky’s Bakery. I got the marzipan roll, a warm, soft, flaky, croissant-like crescent filled with almond paste, and my husband got a meat-filled bastion of butter. We ate every last crumb of both of them while overlooking Puget Sound. With full bellies, we hoped in the car for the 2-hour drive north to Anacortes. 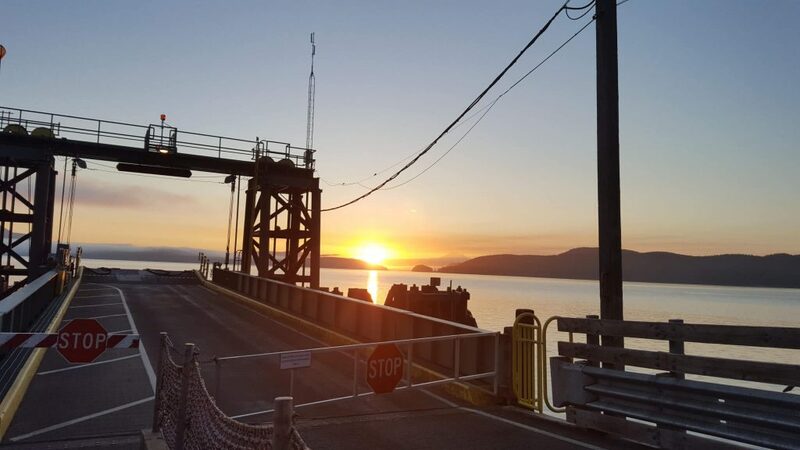 We stayed with a friend for the night (eat at the yummy yummy yummy Adrift and get the mussels), then hopped on the Washington State Ferry to Friday Harbor. Fortunately, since we were staying at the Lopez Islander Resort, we found free parking at the Anacortes terminal, saving about $12. 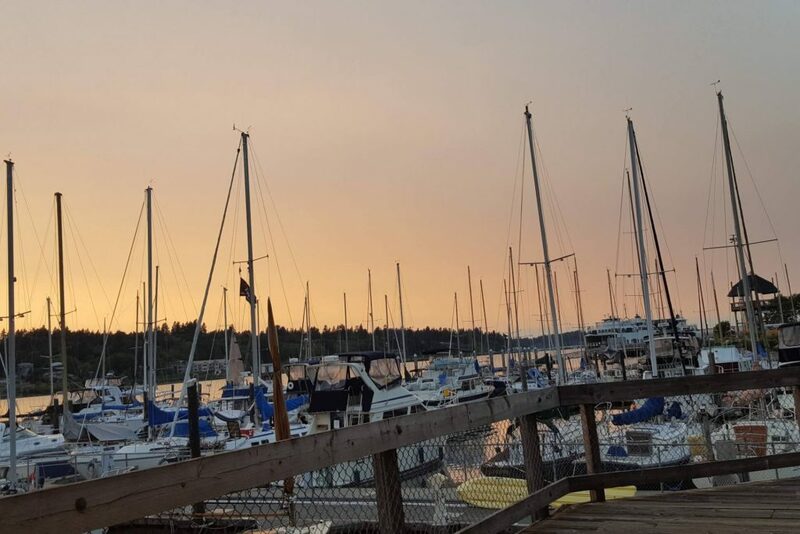 At Friday Harbor, we grabbed a good fish sandwich at Hungry Clam, where the cole slaw was great and the views of the harbor were fantastic. We then stopped in the local grocery for some fresh lox, mascarpone cheese, crackers and a bottle of wine, and jumped on San JuanTransit. San Juan Transit has two transit lines, and the schedule can be a bit difficult to read. Just ask the driver, and he’ll sort it out for you. We loved our driver, who also owned the business. He clearly enjoyed entertaining the tourists and sincerely wanted us to have a good time. 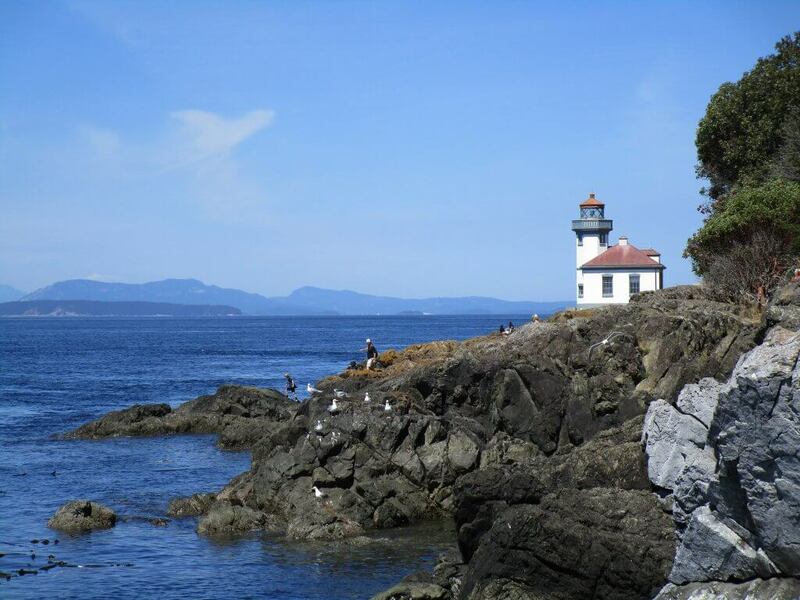 We asked him for the best place to day hike, and he took us right out to Lime Kiln Point State Park. At Lime Kiln, we hiked about a mile on the coastal trail down to the point to hunt for orcas. Sadly, we didn’t see any all day, but the views rewarded us, and the lighthouse thrilled us. 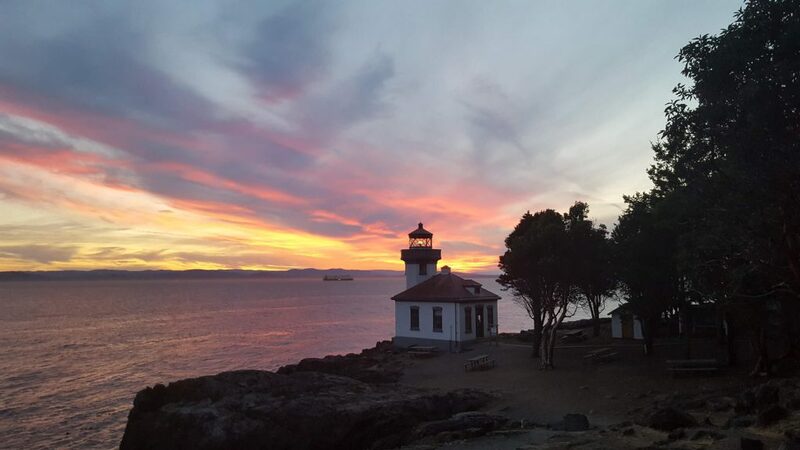 We headed north, stopped in the Lime Kiln Lighthouse, talked to the orca researches, and got a tally of how many and which whales they had recently seen. The news wasn’t good. From there, we balanced along about 2 more miles of root-grown trail to the historic lime kilns, then came back to the Light House to watch the sunset. The fresh lox floated on top of our mascarpone cheese, giving us a tasty delight. Sunrise peaked through the fog bank as we journeyed on the ferry the next morning to Lopez Island. The resort picked us up at the ferry dock, and we were quickly mounted on our rented bikes from Lopez Bicycle Works. The friendliest people live and work in Lopez, and they recommended a ride to Iceberg Point and then a hike to the sea. Off we went down what I named “Blackberry Trail” to get to Iceberg Point. The ride should have taken about 90 minutes, but I couldn’t keep from stopping to eat the abundant blackberries everywhere along the pastoral ride to the coast. Eventually we made it to another small grocery where we picked up our second helping of salmon, this time smoked, and mascarpone cheese, then made the remaining three miles to the beach. 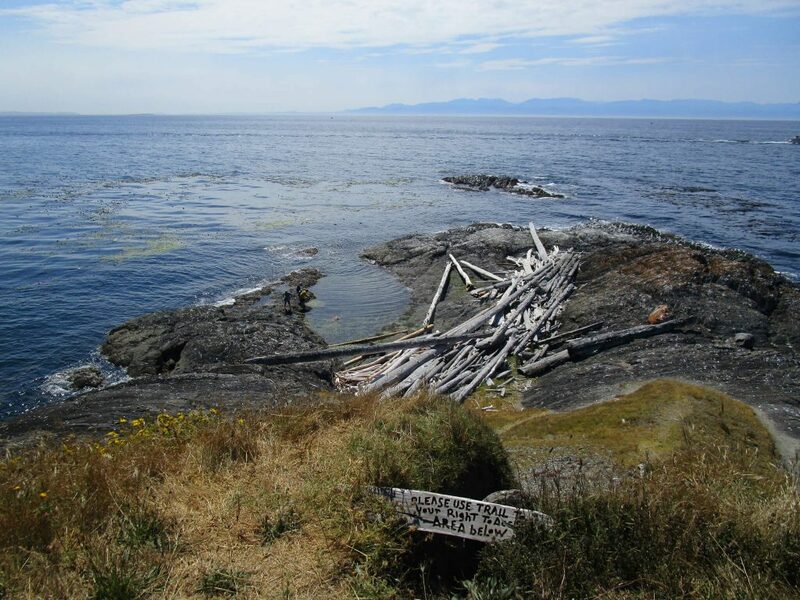 The day hike to Iceberg Point takes you through private lands (thanks private land owners), a healthy wooded forest, and then out to a point that looks WEST to Canada. Enjoy the rugged bluffs and rocky shorelines, and if you’re brave, attempt to cross the large driftwood logs that make bridges across the coves. I wasn’t that brave. But I did climb up to the white obelisk to read about how the landmark marks the historic wayfaring of the western US border and the western Canadian border. After riding back into town and stopping at Holly B’s Bakery to get a cinnamon treat (stop here on the way to heaven to bring St Peter a treat), we made a pit stop at the San Juan Islands National Monument office. It’s a worthy trek to be able to talk to the staff about the monuments, lighthouses, and shorelines of the National Monument, and a great place to pick up a few stickers and brochures. You can even get information on how to be a docent at the most northern lighthouse in the US. 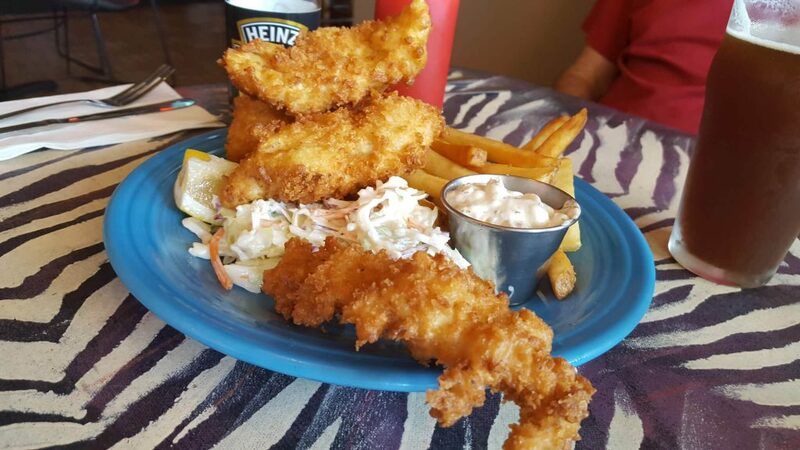 We had quite an appetite after 20 miles of riding and 4 of hiking, so fish and chips sounded like a great idea. The locals sent us to the Galley Restaurant. This dive, hole-in-the-wall, locals only, no website, dream come true of a place, had us feasting on the best fish and chips I’ve ever eaten. Lightly browned, slightly crispy, local beer-bettered, white fish topped perfectly wide fries. The bartender served us, the locals ignored us, and we rolled out of there as happy as could be. Another fog-banked sunrise greeted us the next morning for our 2-ferry and 4-hour drive to La Push to catch low tide. 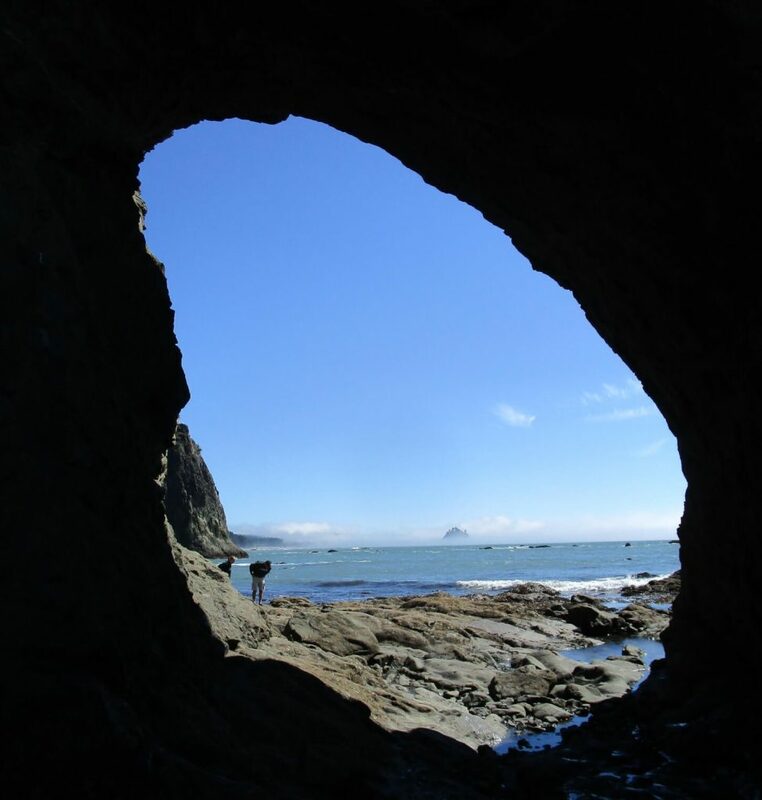 I had read about the famous low tide hike to Hole-in-the-Wall prior to our trip, and I had planned the entire trip around getting to this low-tide hike. We timed it perfectly. 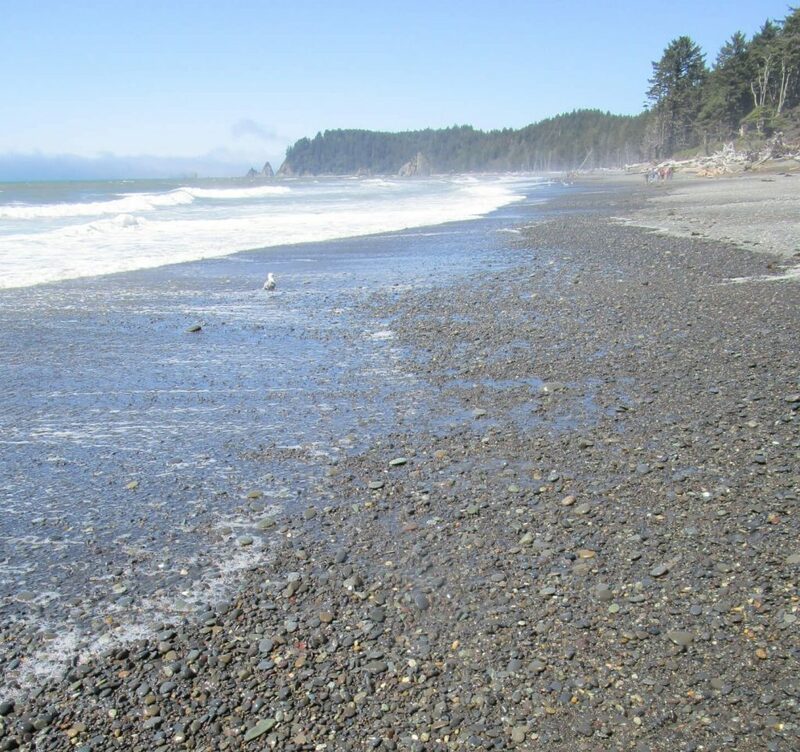 Walking the Washington coastline is much different than many other beaches. There’s not a lot of sand here; it’s mostly round rock of one to four inches. In some places, the rock cements with sand making walking a bit easier, but in most cases, walking is challenging. Low tide makes it easier. 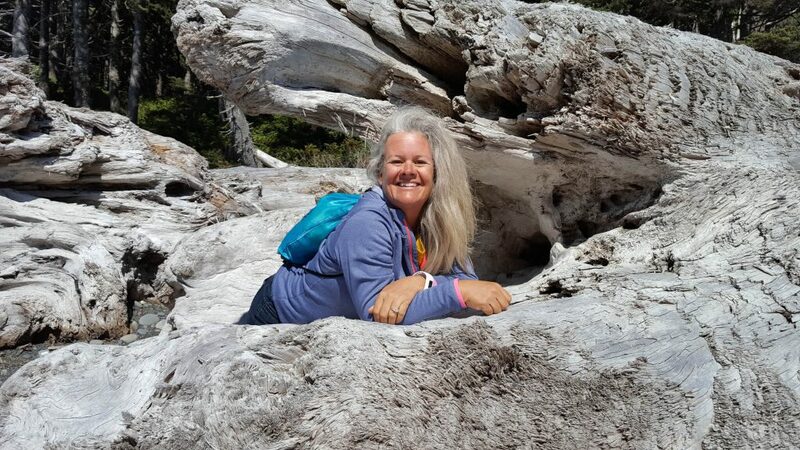 For this hike, we headed north out of the parking lot at Rialto Beach after climbing over beautifully worn and wind-hewn, giant logs of driftwood stacked like spaghetti along the shoreline. Breezes gusted through my hoodie and windbreaker while we traipsed along the pebbly shoreline. The 2-mile trek took about an hour. At Hole in the Wall, the tide stayed out while the tide pools came in. 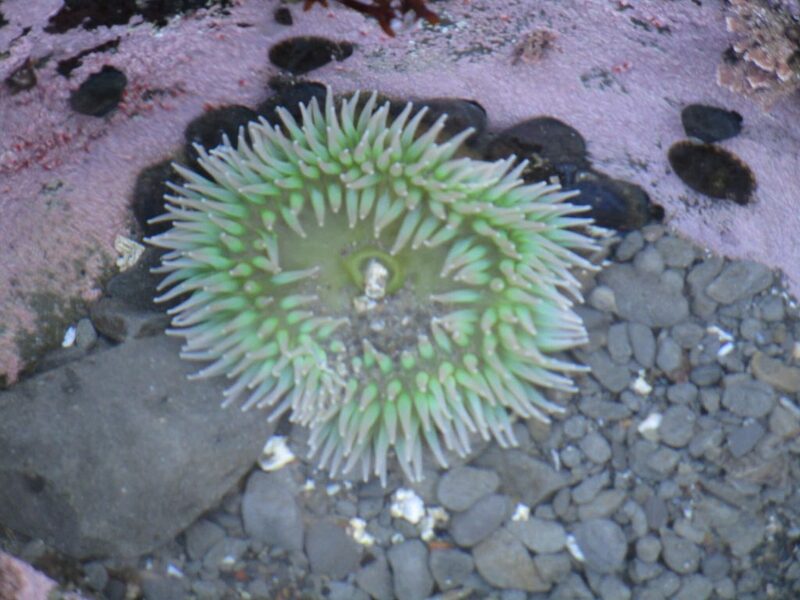 For an hour, we hunted sea anemones, sea cucumbers, baby shrimp, and other sea critters, gleefully squealing at bright colors, soft textures, and salty sprays. As the tide began to come back in, we made our way down the shoreline to our car, marveling at the driftwood forest to the east and giant sea rock gardens to the west. For dinner, we couldn’t resist the thought of a piece of salmon pulled out of the Pacific that day. Thus, we stopped at the River’s Edge, which is run by the local Quileute Tribe. Let’s just say service was unique. The salmon completely made us forget our odd experience. 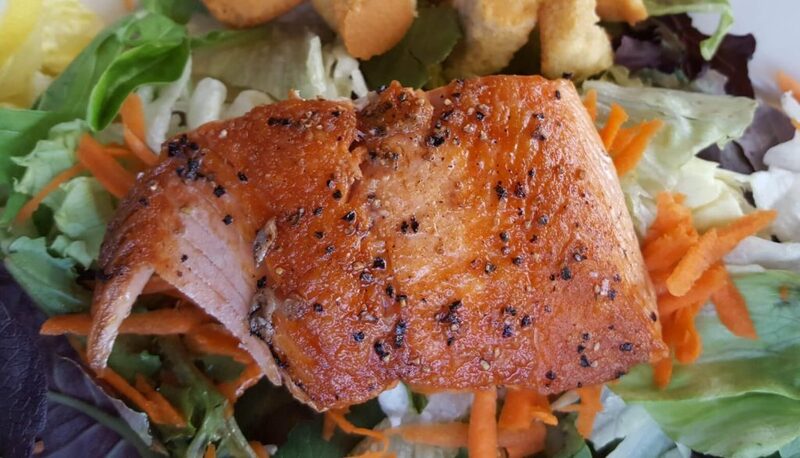 The salmon’s natural color, its fresh taste and juicy preparation will bring us back again and again. I could write an entire blog post about our accommodations for the night, but I’ll keep it short. We checked into the Misty Valley Inn, just up the road from Forks. I have to say my expectations were low–it’s right off the main drag in the middle of nowhere. But the gazillion-thread count bed sheets, dessert buffet filled with chocolate-raspberry, homemade, layer cake and lemon bars, herbal tea bar of a thousand flavors and hot tub overlooking Douglas Fir and Sitka Pine didn’t even prepare us for our breakfast. The morning started off with a custom tray of hot apple cider and coffee delivered to our bedroom door preciously at the time requested which included a hand-printed itinerary for the day of weather and tides. We donned our lush robes and ate breakfast on the porch while watching blue jays and squirrels feast at the feeders. 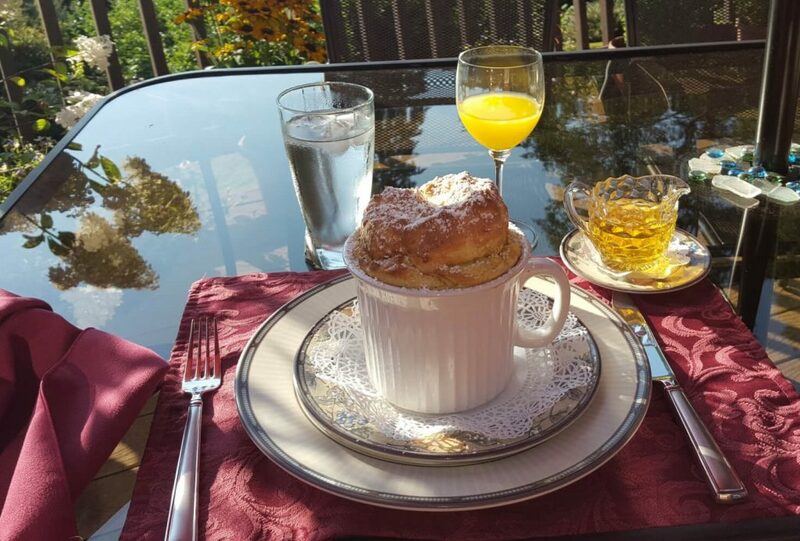 We looked around for the angels and pegasuses that must have made my husband’s apple souffle or my Moroccan omelet. 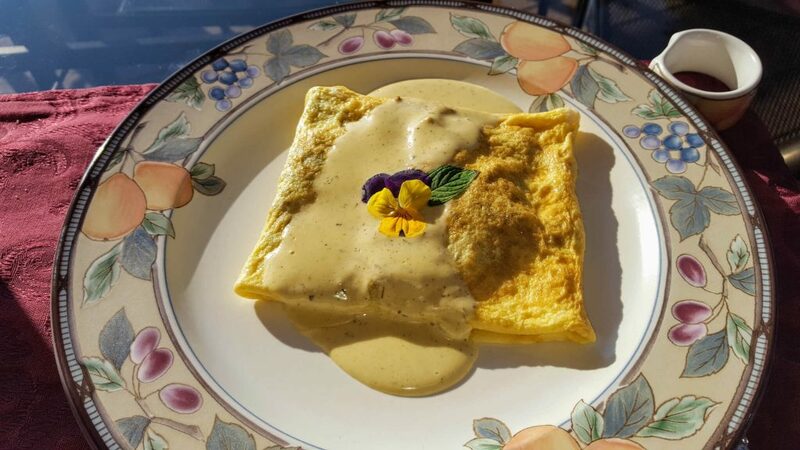 Framed by fresh orange juice and hand-made scones, followed by pears dipped in unicorn tears, the souffle shuffled our taste buds and the omelette spun all five senses into overdrive. Yup, they were that good. The Olympic peninsula and Olympic National Park challenge the day tripper to the thru hiker. Living in Denver, we weren’t that interested in a hike in the mountains through the forest. We’ve got thousands of miles of similar trail in Colorado. 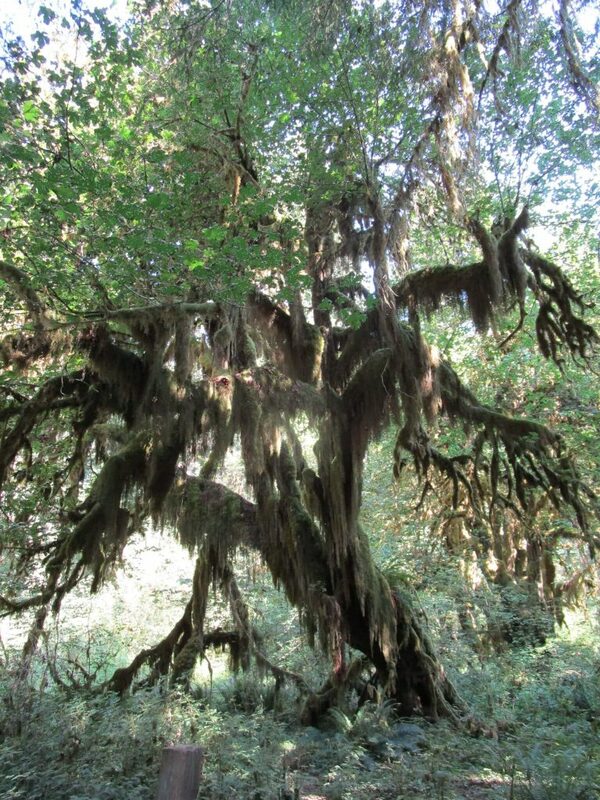 But the thought of a rain forest tantalized our imaginations, so off we went to the Hoh Rain Forest Visitor Center. We hiked both the Spruce Trail and the Hall of Moses Trail. We got there right at opening time, and by the time we were finished, the Visitor’s Center was packed. Both trails are similar. If you have time to only do one, I recommend the Spruce Trail. Passing through moss-covered branches that drip green and through tall Sitkas and Spruce, keep on the look out for gnomes and fairies! This is the forest you dream about where forest creatures come to play. Just when you think you won’t find your way out, the Spruce Trail meanders along the river. 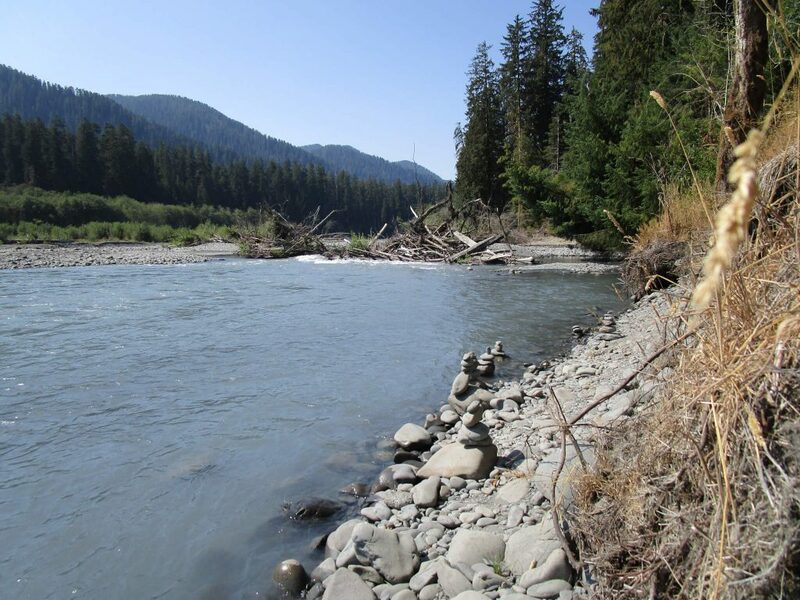 The Hoh River, with its silvery shimmer, has a nice bank on which to relax and where you hope to see salmon. We didn’t see any adults, but in the nearby streams, we saw many fry. I can imagine a large bear standing on a fallen log with his mouth open, waiting for dinner to jump in! To have a great time at Hoh, keep three things in mind. Pay attention to open hours and road closures. 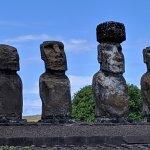 We thought we were done hiking this trip, but we got curious by a comment our Innkeeper had made. “Go see Lake Quinault Lodge.” We were hungry, and choices in the area were few. We stopped at the lodge and had a mediocre and expensive lunch. Not wanting to drive right away so quickly, we went across the street from the lodge to hike the 3-mile loop that combines the World’s Largest Spruce Trail, Maple Glade, and Cascading Terraces. To our surprise, we liked this hike much better than that in Hoh. With undulating climbs, rich fern undercover, tall trees (the tallest! ), footbridges over waterfalls, and fresh pine scents throughout the walk, we found this hike to be more challenging and more interesting than our last one at Hoh. Despite the poor lunch, the hike paid off. Our last night in the northwest, we stayed and ate in the darling town of Olympia. A well-parked marina invited our views, and we found a table at Budd Bay Cafe overlooking the harbor. To our delight, the Cafe had an appetizer menu of 8 items for $1.99 each and Olympia Beer for $1.99 as well. Down the hatch went prawns, crab cakes, mozzarella and tomato skewers, and oysters followed by gulps of beer. Maybe not the best quality, but the price for lots of quantity and full bellies came in at $20.00 for two. Thus, there you have it. 5 must-do day hikes near Seattle, several pescatarian places to eat, and a few places to stay. Sounds like a fun week or weekend getaway to me, how about you? See you somewhere in the world, soon! Thank you so much. It was such a great stay! I can’t wait to come back!